Adding a product to Comicsy is easy. We’ve included a 12 point guide that will give you everything you need to know to get your goods online. Product Title Enter the name of the item you are selling. Be descriptive but not too long. 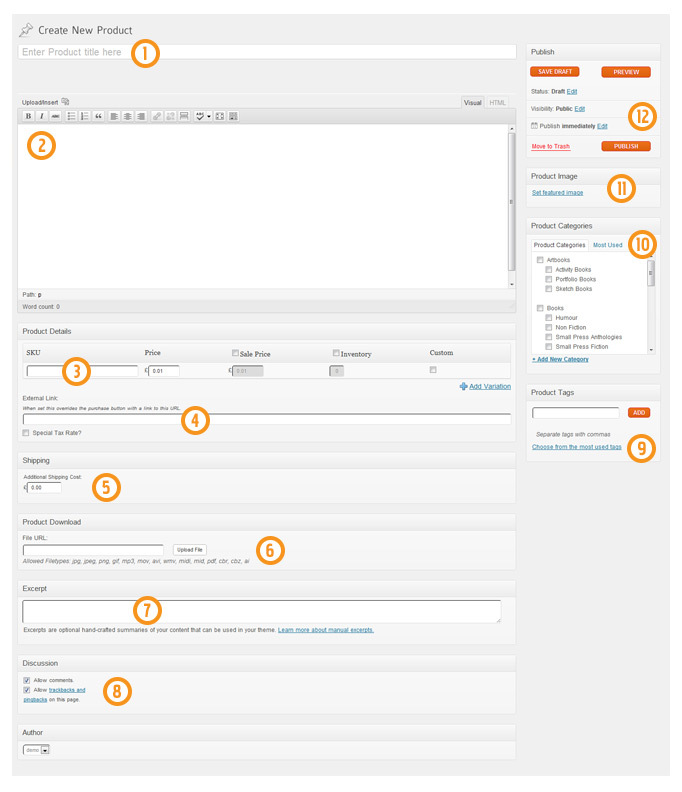 Description In the description panel you are able to add a whole host of information about your product. For those comfortable with coding you can switch to HTML mode using the tab in the top right corner. If you’re not that geeky, stick to the visual WYSIWYG mode and make use of the handy buttons to style your content more attractively. Just above those buttons is the option to ‘Upload/Insert’. Clicking on the icon will open the Add Media control panel for managing your images. From this section you can upload new pictures and insert them in to your product description. For more information on how to make the most of what WordPress has to offer take a look at this guide here. Sale Price: Great for offering your goods at a discounted price. Inventory: If you have a limited number of items to sell add your stock total here. After every sale this level will decrease. External Link Enter a full URL (don’t forget the http:// ) and when the customer clicks to buy your item they will be taken to another website. 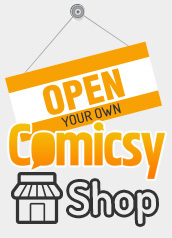 Shipping Shipping details are controlled via the Store Setting tab in the Comicsy easy admin section. The Extra Shipping Costs is used if the product needs extra allowance made for shipping. Product Download If you want to sell a digital download you can upload the file here. Please Note: File size limit is set to 34MB. Smaller file sizes means quicker downloads and lower overheads for ourselves. The Excerpt This is a short catchy description of your product. It is displayed near the top of the product page to encourage users to read more about the product. The except is also displayed when users search for products, so you better make it interesting! Discussion Allow or disallow customer comments on this product. Product Tags These are extremely useful tags which allow you to categorize your products so customers can find them better. The tag cloud on our home page is very useful so be sure to add several short tags that best describe the item. Product Categories Add your items to the correct category so shoppers can find your product. Categories are displayed in the Comicsy header bar on every page on our site. Product Image Here you can set a featured image, which will be used as the thumbnail image and the main product image on the product page. This is done via the Add Media control panel. Add the image using the uploader or select a picture from your image library. Then click ‘ Use as featured image’ to assign this as the main picture. Publish This section allows you to control the availability of a product. Preview the item, save it as a draft, or publish it when you’re ready to go live. You can always unpublish the item, if you wish to remove it from the site without deleting it, at any time.